Elegant country house in Val d’Orcia for 10 people. The villa is situated on top of a hill in a panoramic position, in one of the most fascinating contexts of the Tuscan countryside. The Val d’Orcia stretching from Siena Umbria, is a natural artistic natural, since 2004 it has been recognized dall’Unescu World Heritage Site for its excellent preservation of the beauty of the landscape. The villa has been built in compliance with the principles of bio-architecture, keeping the materials and authentic forms of Tuscan farmhouses. Inside the house there are 2 apartments that can be rented individually or as a villa for exclusive use. Outside the swimming pool and panoramic views of the surrounding valley are the backdrop to your holiday in Tuscany. In the garden there is a BBQ and a gazebo with table and chairs. 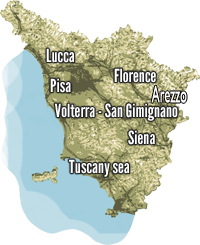 A few kilometers away you can visit the towns of Montepulciano, Pienza and Chianciano Terme. Guests have access to a rooftop pool with deck chairs and beach umbrellas overlooking the surrounding countryside. A few minutes drive are easily accessible most famous spas in Tuscany: Chianciano, Montepulciano and San Casciano dei Bagni.